When the day is going to be long or you’ve got extra kids underfoot, make a fun meal for everyone. It will be a bright spot in your day and you’ll find kids eating food they won’t normally eat. Jazz it up with some fancy names, and your kids will be begging to come to the table. Pigs in a Blanket are so simple and easy. All you need is hot dogs and refrigerator biscuits or crescent rolls. 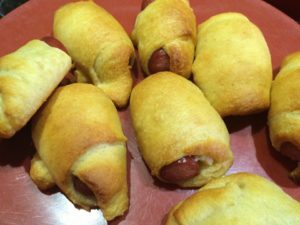 Cut the hot dogs in half and roll each one up inside the crescent roll or biscuit. You can roll them up beginning at the short or the wide end. Either way works. Bake according to the directions on the container. Serve with ketchup or mustard – or both. 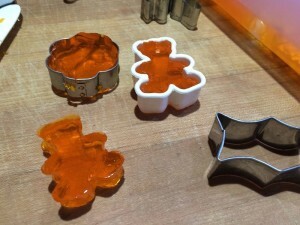 Finger Jello is another fun treat, especially if you cut the jello into special shapes. Choose the flavor/color by the season. Red for Christmas and Valentine’s day, green for St. Patrick’s day, and watermelon for summer flavor. You can find the recipe for that here. 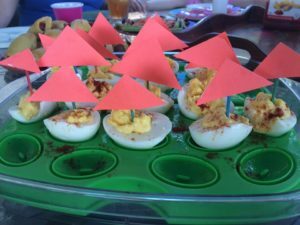 Sailboat Eggs are fun to make and serve. For the recipe I use, click here. To make the sails, cut triangles out of any color paper. If you’d like, you can use them as name tags. Label the sail and put the egg on the child’s plate. A toothpick and some Scotch tape will secure the sail for you. 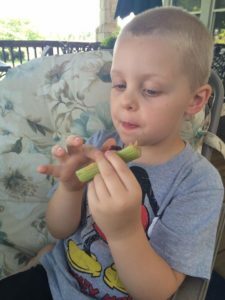 Ants on a Log are a fun way to get kids to eat some raisins or craisins. (I tell them the craisins are crazy raisins.) 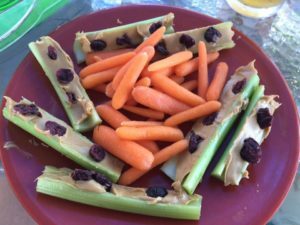 Put peanut butter on celery sticks and then place raisins, craisins, chocolate chips, or some other fruit or nut on top of the peanut butter. This guy wasn’t too sure about the craisins but ended up eating everything, one finger lick at a time. 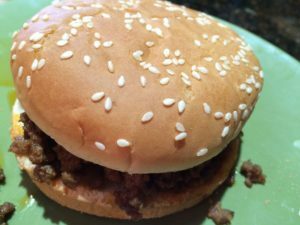 Sloppy Jo sandwiches can be served in miniature buns or hot dog buns. Once I changed the name of Sloppy Jo sandwiches to Sassy Sadie sandwiches just because a child visiting my house that day didn’t like Sloppy Jos. 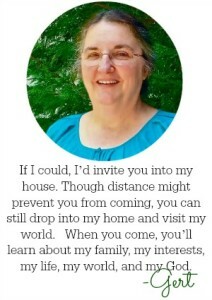 She snarfed them up – was it because she was intrigued by their name? For younger kids, hot dog buns work well for these sandwiches. They are easier to handle and can be cut in half for small kids. When you have extra kids underfoot, finger foods make for easy clean-up. They also give an extra impetus to clean a plate during mealtime. Come up with your own ideas and designs. 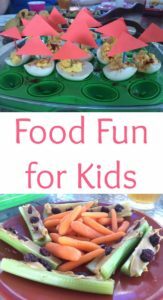 It’s fun to keep kids guessing and make mealtimes interesting.